Every month at Run Walk for Life, you get encouraged to set a goal for the month… it apparently gets you motivated. Apparently they’re right, because that goal setting works for me. LOL! This month my goals were to run 100km, and to do one run of 15km. I’ve achieved both! ran a total of 111,9km! Woot! I’ve also set a few personal bests this month too! I’ve run one race… the 10km FNB Heritage Run… which was a little short of 10km actually, but I did it in my best average pace ever! I bought the most awesome little NIKE running belt with an elasticated strap that expands and fits my phone and keys properly… so I can take photos on my runs. I was really looking forward to the race. I was planning on taking photos as we ran through the city… but once I got going I was loathe to stop! LOL! I stopped once on the Mandela Bridge… how could I not take a photo of running over my favourite spot in the city. It was actually such a festive race. Every km had dancers or something happening, and the route took us past some of the best sights in the city. I hope they do it again next year… and hopefully it’ll be bigger! I don’t think there were more than 1000 people running it. The big question though, is how ready I’m getting for the Soweto Marathon? I think I’ll be ok. 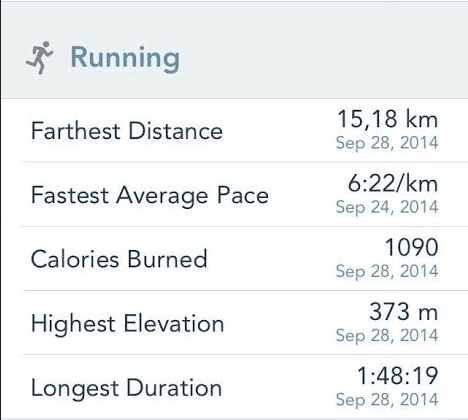 But I must say that Sunday’s run of 15km took a lot. I was sore at the end, and tired. I finally found my limit… every other long run I’ve done, I’ve felt like I could carry on. So this week I think I’ll take it easy, and then hit the streets in ernest again next week. It’s only a month to go before my first 21km!! Eek!